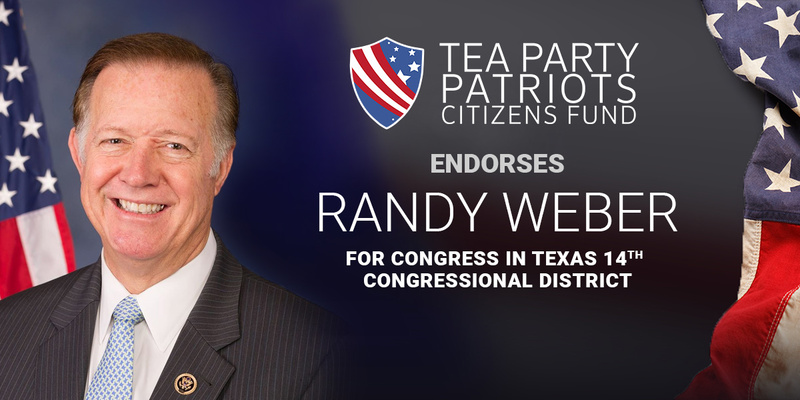 ATLANTA, Ga. – Tea Party Patriots Citizens Fund (TPPCF) Chairman Jenny Beth Martin today released the following statement, announcing that the Super PAC associated with the nation’s largest Tea Party group has endorsed Randy Weber for reelection to Congress in Texas’s 14th congressional district. “Randy Weber has been a strong constitutional conservative ever since arriving in Congress. And he’s got a backbone, too – as was made evident when he became one of only nine Republicans to vote for an alternative to Paul Ryan for Speaker in the fall of 2015. “That’s the kind of backbone it’s going to take to truly drain the swamp. “Randy fights for tax cuts to stimulate economic growth and the better and better-paying jobs that result. He fights for spending cuts because he knows it’s wrong to saddle our children with trillions of dollars of debt. And he fights for the rule of law because he knows amnesty for illegal immigrants is wrong. “He fought for true repeal of ObamaCare, and he is a strong supporter of President Trump and his legislative agenda.